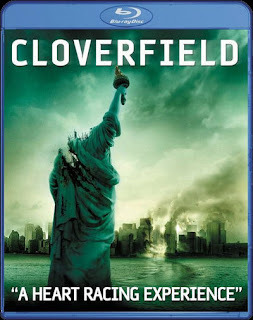 Paramount has unleashed the specs and box art for the Blu-ray version of Cloverfield, which will be released on June 3rd. The suggested retail price is $39.95, and will contain all of the features of the standard DVD, plus an exclusive picture-in-graphics track. The new disc will also feature 1080p HD video, and Dolby TrueHD 5.1 Surround. It looks like it is time to finally upgrade the home theater, or at least pick up an inexpensive Blu-Ray drive for the computer. * Thanks to Tagruato Blogspot for emailing me this. My recommendation is getting a PS3, 399$. Its the best value player. It is upgradable (It now supports BD-Live content), It can also serve as a media center and of course Its also an amazing gaming console. inexpensive?!? I could barely afford the regular DVD!! I suggest not bothering with Blu-Ray at all yet for anyone who just likes movies and isn't a videophile. It's completely pointless at this point and everything about it is too expensive. on the first link, it said somewhere there where "no less than 14 easter eggs". what's that supposed to mean?? WhenCloverfieldHit Contest - Last Day To Vote! Cloverfield Is Dead? Long Live Cloverfield! Michael Giacchino's "Roar" Pulled From iTunes?